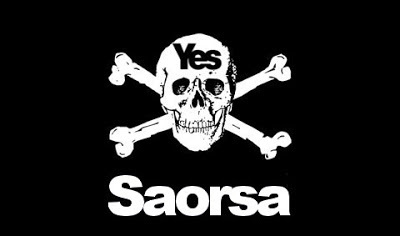 Tocasaid: Yes Scotland. No Gaelic. Feart horses. Yes Scotland. No Gaelic. Feart horses. It's the language that dare not speak its name. Partly because its name - Scots/ Scottish - has been hijacked by another - Inglis/ Anglo-Saxon. There are those in the movement for Scottish self-determination who regularly, and quite rightly, draw attention to how Scotland and her culture, politics and weather even is overlooked by London based navel-gazers. One also notices that independence movements in other small nations - thinking Basque Country, Wales, Catalunya and Quebec in particular - wear their languages as badges of pride. Here though, the 'Nats' have caught the Scots cringe. Instead of educating Scots about the place of Gaelic in their history and present, they've airbrushed it from their glossy campaign. The Gaelic Language (Scotland) Act 2005 gives Gaelic status as an 'official' language of Scotland that is entitled to 'equal respect' with the Queen's Engerlish. However, on top of Yes Scotland's stubborn refusal to countenance any Gàidhlig - or Scottish to be old-fashioned - the Scottish Government has also declined to put the language alongside English on the referendum ballot paper. Whatever the stated rationale for the Government’s position, it seems reasonably clear that political calculation plays a role. As part of its general strategy of endeavouring not to ‘frighten the horses’ in relation to the referendum vote, the Government may well fear that a bilingual English-Gaelic referendum paper could alienate some wavering voters who might (quite unrealistically) see Gaelic as some kind of nationalist totem. A number of Gaelic-speaking independence supporters have backed this view, arguing that the symbolic value of a bilingual ballot paper is outweighed by this political risk. Some say that the 'Gaels need to do it for themselves'. Aye, we should and some of us are. However, a similar argument could also be made for the Lesbian/ Gay, Asian and 'business' communities who are well catered for by YesScotland. Not only that, but as a campaign - should you target your audience or should your intended audience 'do it for themselves'? 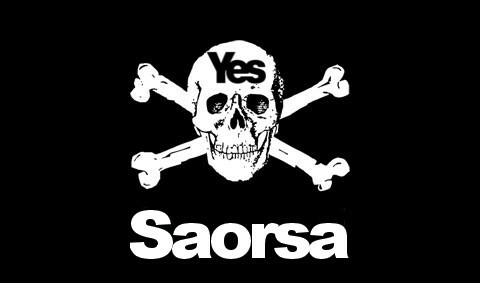 What will YesScotland do then to convince the 'don't knows' in the Gàidhlig community? To be crude, if the London establishment and media treat us like 'Porridge Wogs' then are the Gaels amongst us even less deserving of recognition and respect? The fact that some Gaels think this way is neither here nor there - every indigenous and once-repressed people has it's own doubters. Centuries of repression and decades of having the language beat out of you in school will leave some people's self-respect at a low ebb. 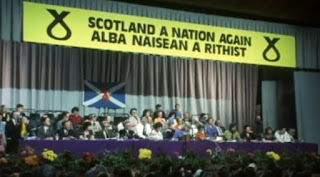 But is Gaelic a 'nationalist totem'? No for fucks sake, it's a medium. I don't know any Gaelic speakers who wear the long plaid, cover themselves in woad or Celtic tattoos and who hanker for a life amonsgt the hills acting out epic lifestyles in the vein of Cù Chulainn, Sgàthach or Fionn MacCumhail. 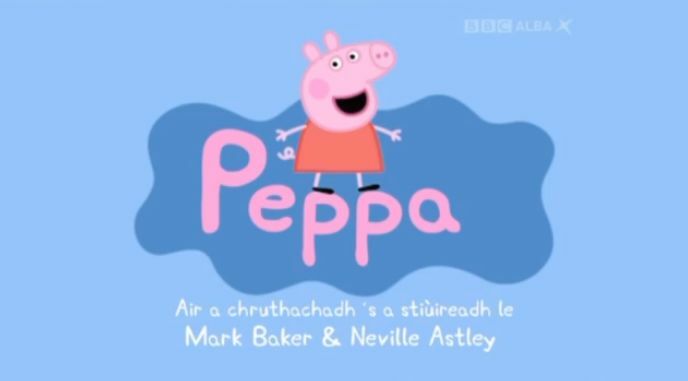 Will Gaelic speaking cartoon pigs threaten YesScotland's feart horses? On the other hand we use Gaelic in everday social media, at work and at home like anyone else. And while our classical Scottish literature from the 'Fenian cycle' is an amazing part of our heritage - my kids and those at school will digest it in glossy-covered text books or from animated cartoons. Older users of the language may upload Gaelic for Punks lessons to SoundCloud or play air-guitar to Oi Polloi. As Nancy Dorian points out in an essay on the Gaelic dialects of the east coast of Sutherland, languages enjoy the perceived status of those who speak them by those who dominate/ rule them. So, in the eyes of YesScotland, we really are Porridge Wogs? Now the important aspect of this background is the fact that languages -- anywhere, any time -- have no independent status of their own. Instead they have the status of the people who speak them. This explains why the prestige of languages can rise or fall so dramatically in a short time if the fortunes of their speakers undergo an abrupt change. If you look at Quechua, the language of the Incas, it was an imperial language, the dominant language of a large part of the Andean region before the Spanish arrived, and the Incas had in fact succeeded in imposing it on a number of the peoples whom they conquered. Then came the Spaniards, and before very long, Quechua was an insignificant Indian language, associated with backwardness and poverty. It wasn’t the language that changed, but the circumstances of its speakers. The same thing happened to Irish, which was a language of great learning at a time when the Germanic peoples, including the English, were still largely illiterate and were by comparison with the Irish very little acquainted with the learning of the Classical world. The Viking conquest, the Norman conquest, and most of all the Cromwellian conquest and the period of the Penal Laws broke the Irish, destroying the culture that had supported Irish learning. As the Irish lost their aristocracy and became a peasantry, their language was transmuted into a peasant language, too, in spite of its past glories. Scottish Gaelic had claims to ancient learning and to literary respectability, too, at one point, as an offshoot of Irish with a subsequent literary tradition of its own, but the failure of the Jacobite risings in 1715 and 1746 did to Gaelic roughly what Cromwell did to Irish, and the tradition was broken and submerged, if not entirely lost. One worry, especially of 'radical' campaigners for self-determination, is that the SNP's vision of independence is too 'lite'. Is there any evidence of a different approach to Gaelic? We've had support from Thatcher's little puppet here, Michael Forsyth as well as from Labour's right-wing Unionist Brian Wilson. We've had a little from the 'Nats'. In the SNP's latest dereliction of duty in relation to Gaelic, their councillors in Glasgow staged a walk-out of a meeting prior to voting through the local Gaelic Language Plan. Poor stuff. YesScotland - get a grip. Do we want a new Scotland populated by feart horses ignorant of their own heritage and culture? Send them a message here. "It's the language that dare not speak its name. Partly because its name - Scots/ Scottish - has been hijacked by another - Inglis/ Anglo-Saxon." Your logic here is fatally flawed. First up, Scottish Gaelic has always identified itself as "Gàidhlig", sometimes suffixing "na h-Alba" for clarity's sake. The terms "Scots" and "Scottish" were only ever used externally -- they were not the Gael's words, so what is to them how we (non-Gaels) use them now? That Scots was once known as English is as irrelevant as the fact that speakers of French, Italian and Spanish (and many others besides) once called their languages "Roman". The term "Anglo-Saxon" is also deficient in that it ignores the very strong influence of Danish Vikings in the family of lects that emerged out of Northumbria/Mercia. "One also notices that independence movements in other small nations - thinking Basque Country, Wales, Catalunya and Quebec in particular - wear their languages as badges of pride. Here though, the 'Nats' have caught the Scots cringe. Instead of educating Scots about the place of Gaelic in their history and present, they've airbrushed it from their glossy campaign." Are you not guilty of precisely the same thing? Defining Gaelic as "our language" and studiously ignoring the long history of the Lowland Scots tongue? Historically, Gaelic and Scots have developed in parallel, with each borrowing as much from the other. Both have been evolving for over a millenia and a half in parts of what is now Scotland. Why should we pit one against the other? Sa chiad dol a-mach... Of course, Gaels did not refer to themselves by the English term 'Scottish' but their own equivalent 'Albannach' was most certainly used. Aiseirigh na Seann Chanan Albannaich by Alasdair Mac Mhaighstir Alasdair from 1751 in one example and I'm sure scholars could point you to more. I also believe that the warcry of Wallace's and Bruce's armies was 'Albannaich!'. I doubt that MacMhaighstir Alasdair's reference to 'the old Scottish tongue' meant Inglis or the dialect of Anglo-Saxon that is known variously today as 'Scots', Lallans or Doric. Indeed, to call it 'Lallans' is to suggest that Gaelic's own history in the Lowlands is in question. As I'm sure you know, 16th century clerics writing in Latin referrred to 'Scottice' (which subsequently became know as 'Erse' or Gaelic) and 'Inglis'. As pro-Inglis activists have pointed out, the government of Scotland around this time was 'Scots speaking'. Does this mean that the Statutes of Iona, an anti-Gaelic piece of legislation was enancted by those who language we now call 'Scots'? I don't deny the existence of a tongue that developed seperatetly to it's fellow Sasannach counterpart but to call it Scots in wrong. And aye, Spanish and French still are 'Roman' languages in the same way as Scots English and English are Anglo-Saxon and Irish and Scottish are Celtic/ Goidelic. They called themselves Albannaich, but their language was never "Albannais", was it? Mac Mhaighstir Alasdair was surely consciously politicking with the term "Seann Chànan Albanach", just as his contempories on the other side of the linguistic divide were politicking with the word Scots. To celebrate one while denigrating the other is nothing if not hypocritical. And? 'Gaelic' or 'Scottish' in Sasannais, was the language of the Scots. It was the language of the early kings of Alba and the language of Scotland's kings until James IV. MacMhaighstir Alasdair had every right to refer to his language as Scottish, for that's what it was. 'Inglis' became known as 'Scots' in a political decision aimed at diminishing Gaelic in Scotland and Anglifying the nation. It worked. The indigenous Scottish tongue was divorced from her nation. The effects of this are still seen and heard today in the virulent anti-Gaelic comments in various media forums. Scots Inglis/English exists and I don't contest that. Most of use a smattering of it. That doesn't mean that Scottish isn't the correct term for Gaelic. So you call Gaelic "the" indigenous Scottish tongue... why? Because Scots came from Northern Europe? But then Gaelic's no better, as conventional history puts it as arriving in Scotland from Ireland less than a century before the Anglo-Saxons are thought to have taken over the Brythonic town of Dunbar. There is no logic by which you can identify Gaelic as indigenous and refuse that status to Scots. Foghnaidh na dh'fhoghnas a bhalaich. "There is no logic by which you can identify Gaelic as indigenous and refuse that status to Scots." I am siding with Tocasaid here. He is right to call Gaelic Albannais. Gaelic was the language in which the kingdom of Alba was united, founded and then ruled. Without the Gaelic language, the language of the Albannach, there wouldn't have even been a concept of Alba, let alone the country itself. Because English chroniclers called Alba Scotland from the latin, and the Albannaich, Scots or the Scottish, then it would be natural to think of their language, Gaelic, as Scottish, rather than "Scots" as the Northumbrian dialect of English is now called. This doesn't mean that Scots is not Scottish - it developed in Scotland..but it was not party to the creation of the kingdom of Scotland, and cannot be considered Scottish in that sense. Only Gaelic has that claim.